Located in the Jemez Mountains, the area is home to rich pine forests, grassy meadows, and dramatic rock formations. The historical cultural development of Los Alamos, New Mexico has no parallels. This alpine mesa has witnessed numerous settlements: Native Americans from nearby valleys had used the mesa for summer grazing and farming; late nineteenth century homesteaders established small ranches and farms there; the exclusive boys’ ranch school of the town was appropriated by the federal government during World War II to become the home of the Manhattan Project. 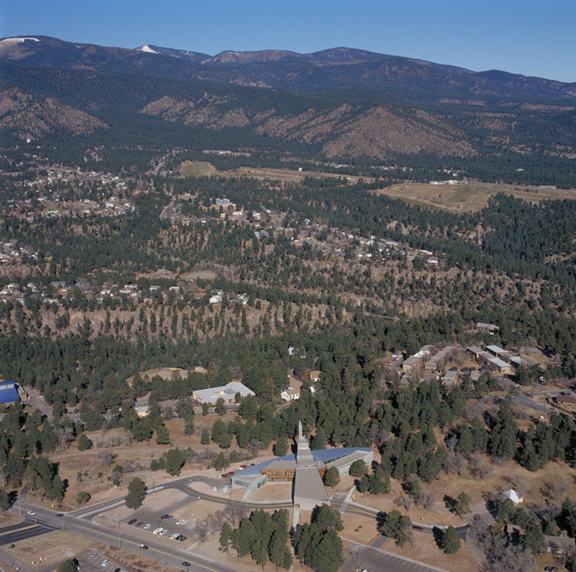 Most residents of the community today are affiliated with Los Alamos National Laboratory, an outgrowth of the original military research outpost. The new library is a sculptural abstraction of and a careful response to the surrounding natural context. Special care was taken in siting the building to minimize impact on existing trees and vegetation. 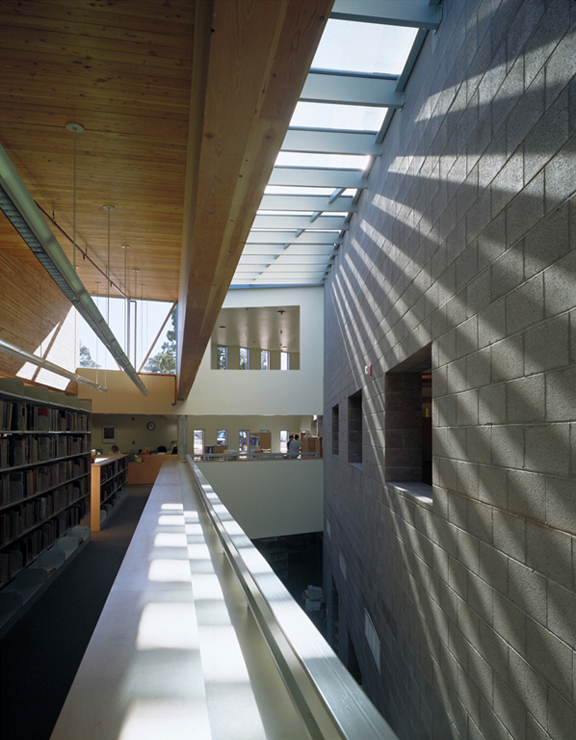 The library sits low, spreading into a curve on the north side in response to the panoramic views. 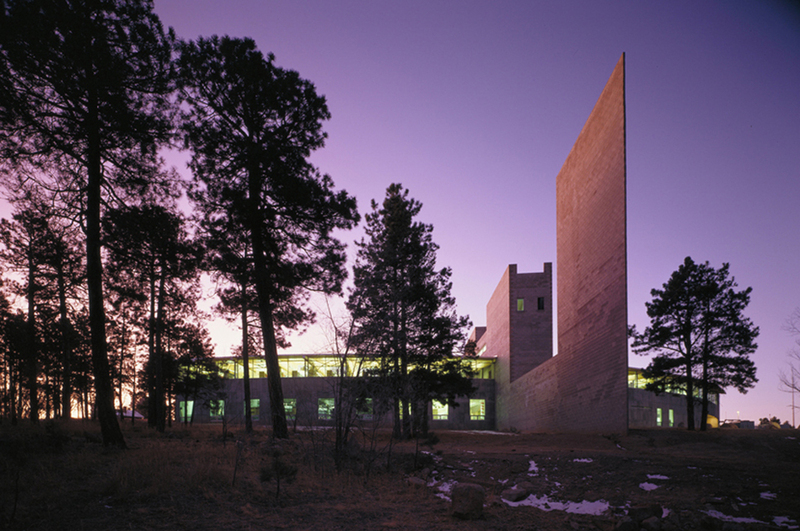 A tall wedge built of stone, analogous to the nearby Tufa stone ridges in the Los Alamos area, cuts through the building. 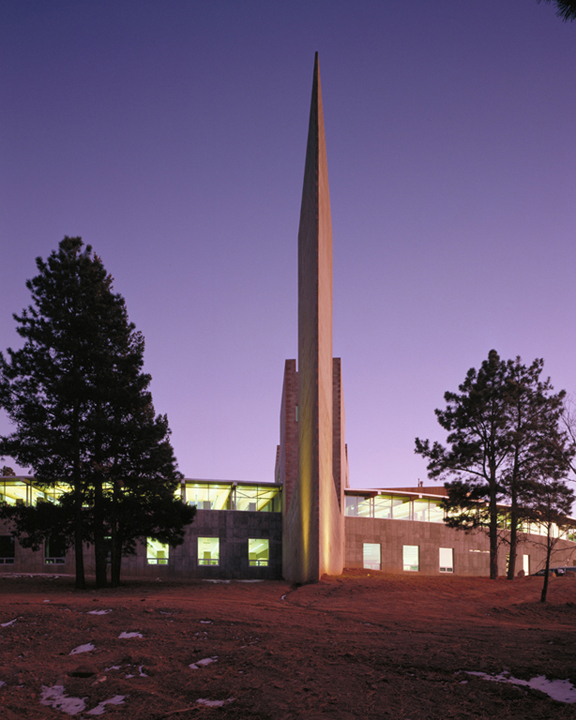 Where the wedge intersects the building, a warm southfacing courtyard is created and serves as the main entry. At the point of entry, Mesa Public Library reaches out to welcome pedestrians with a garden that links the parking and adjacent Municipal Building to the entry. The protective porte cochere serves as a shelter for entering visitors during the cold, snowy winter season in Los Alamos. The building is characterized by two types of spaces: the cellular organization of the “wedge” houses lobby, meeting rooms, a bookstore, and private reading areas; the curved portion of the building is a large, open plan and holds the various stacks. The program required that fiction, nonfiction, reference, young adult, and children’s areas have a defined presence, while still being linked spatially, to allow for monitoring and assisting patrons. South facing clerestory windows bring warm, natural light into the stack areas, while the bank of windows on the northern curving wall open up to the view of Pajarito Mountain. The entry courtyard, reading garden, and children’s reading deck provide multipurpose exterior spaces. Areas of the building have been identified and designed to accommodate future collections expansion.